Book description- 300 passengers. One plane. One bomb. One switch. Welcome to the fast moving world of advanced terrorism where Jihadists in Oman or Afghanistan can blow up buses, trains, and planes in New York, Madrid, or London-without even going there. This is not the world of the future; it is our world as it is! A world unpredictable, unforgiving, and deadly! Bomber Boy was sent to me by Ike Pius himself, its different to what I have ever read, firstly its only short story, which is a first for me since I always get too attached to a book and hate for them to finish so suddenly. Secondly the genre is not something I would normally read, but I actually did enjoy it and would read more thrillers after this one. Normally with short stories I find that I get into them and by the time i’m really enjoying it, the book has ended! Bomber Boy could have been a bit longer and continued with the story more, I would have loved for it to be longer and have more character development with Farouk. This book was really interesting and intense as it relates to similar events that happen today with terrorism. I have always found this topic very interesting in the sense of how a terrorist actually thinks and feels about the things they are doing, Bomber Boy explains this a little which is really interesting. As David Bright said it is written like a true terrorist and it actually is! 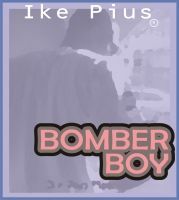 So even though Bomber boy is only a short story Ike Pius has done a really good job the only thing that could have been different is the more background knowledge on the characters and if the story was longer that would have been awesome! I will defiantly be reading more of Ike Pius’s stories and hopefully some more reviews of his books! Im going to give Bomber Boy 4/5 for the reasons i’ve mentioned above. I think this story is great for anyone who loves thrillers or has a general interest in terrorism and war, it really is interesting to read a story based on this. To purchase a copy of Bomber Boy just click here! If you have any questions, or anything to say at all just send me a message!